Everyone loves a good taco, so I figured most people would appreciate a taco cake!! While the shape of the cake may make it seem complicated to make, I promise it’s easier than you’d think! 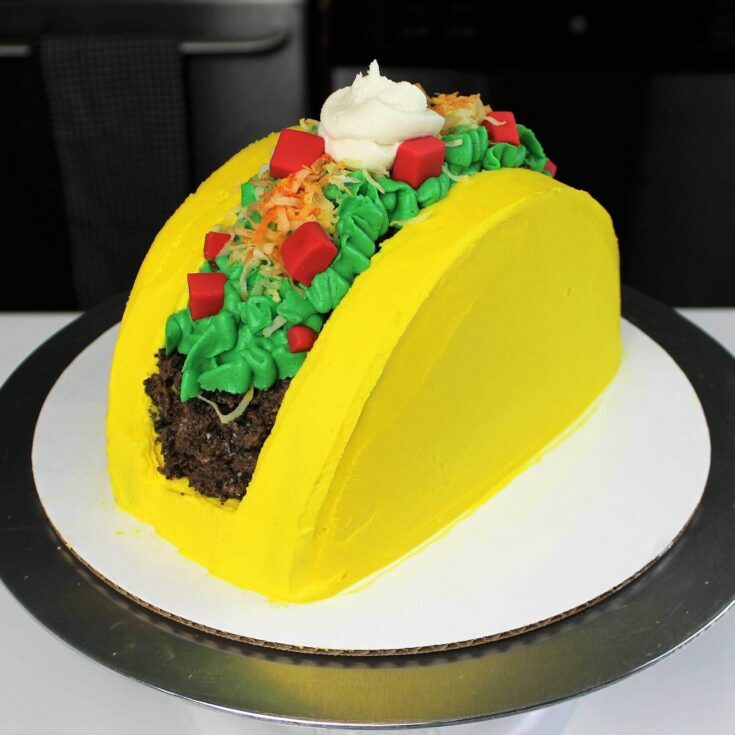 How On Earth Do You Shape The Cake To Look Like A Taco?! This cake cake is made with two round cake layers (one slightly smaller than the other). Each layer is cut in half. Then three of these halved cake layers are sticked upright. This means you’ll end up with an extra half a cake layer. I ended up just eating mine with some leftover buttercream…but you could also make cake pops with it. This taco cake is made with my favorite vanilla layer cake, which has great structure and works wonderfully for shaped cakes like this. The cake is decorated with my American buttercream frosting. The frosting almost acts like a glue. It keeps the layers of this cake in place, and is also used to create most of the “topping” decorations. 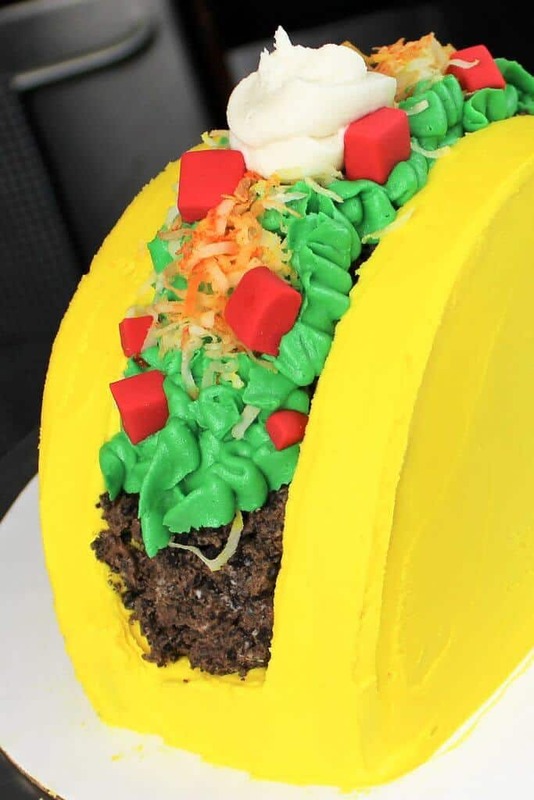 That’s one of my favorite parts of this taco cake, you can decorate it to look just like your favorite tacos! Or if you’re a huge guacamole fan, color some of the buttercream an earthy shade of green, and top your cake with a generous dollop! Whether you’re a taco enthusiast, or just want to celebrate Cinco de Mayo, this cake is perfect for just about any occasion. I’d even venture out and say this could be a summer-themed cake! Maybe that’s stepping too far, but tacos make me think of warm summer nights. A lot of you (and myself, for that matter) like to make your cakes ahead of time! This cake can totally be made in advance. That way if you need this cake on a weekday, you don’t have to stay up late slaving away the night before. It keeps incredibly well, and will taste just as delicious. You can make the cake layers in advance! They can be made and frozen several days (or weeks) in advance if they’re stored properly. The buttercream can also be made ahead of time! It keeps in the fridge for up to a month. Just be sure to store it in an airtight container. Give it a REALLY good stir once it thaws, to get rid of any air bubbles that may have formed while it thawed. Once the cake is assembled and frosted, it can be stored in the fridge or freezer for several days! The frosting will help lock all the moisture in, and keep the cake layers moist. If you choose to put it in the freezer, transfer the cake to the fridge the day before you plan to cut into it. This will minimize the temperature shock and reduce the risk of condensation. The cake will need a couple hours to come to room temperature. Be sure to take it out of the fridge and let it sit for a bit before you plan to cut into it. What About The Chocolate Cake Layer In The Center Of Your Cake!? In the cake shown below, I actually ended up using a chocolate cake layer for the center of the cake. I happened to have one on hand from another baking project! In my recipe below, I instruct you to make all vanilla cake layers. This just makes the recipe a bit simpler. Otherwise, you’d have to make two cake batters, and it would take a lot more work! If you’re totally set on having a chocolate cake layer in the center of your cake, you can put half of your cake batter in a separate bowl. Mix in 1/3 cup baking cocoa, an extra Tbsp of buttermilk, and an extra Tbsp of egg whites. Pour this batter into the six inch prepared cake pan, and bake as instructed below. 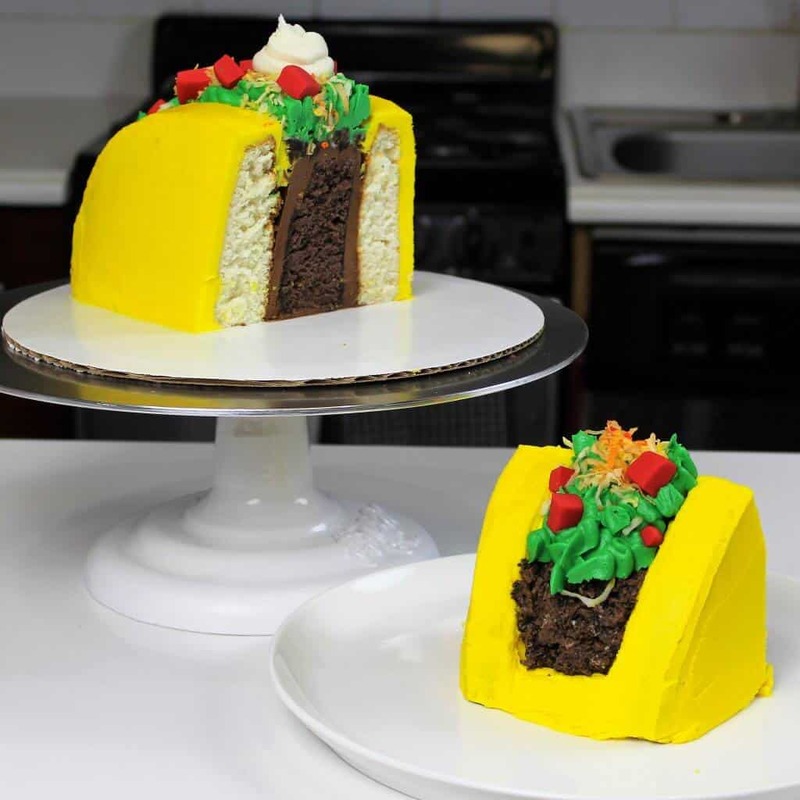 This taco cake is WAY easier to make than you'd think! All you need are two cake layers and frosting!! It's perfect for Taco Tuesdays, or Cinco De Mayo!! Preheat oven to 350°F. Line one seven-inch pan and one six inch pan with parchment rounds, and grease with non-stick cooking spray. Mix together all dry ingredients (flour, baking powder, sugar, and salt) in a stand mixer with a paddle attachment, until fully combined. Divide batter between the prepared cake pans, filling them the same height. Bake for 35-37 minutes, or until a skewer comes out clean. Allow to cool for 10 minutes, then run an offset spatula around perimeter of the pan to separate the cake from the pan. Place cake layers into the freezer for 45 minutes, to accelerate the cooling process. Once the layers have fully cooled, level the top of both layers using a serrated knife. While these layers bake pretty flat, it's important that the layers are even since we'll be stacking them upright! Place 1 1/2 cups of frosting into a separate bowl, and mix in 1/4 cup of cocoa, and 2 tsp of heavy cream to make chocolate buttercream. To create the "beef" of the taco, add 1/2 cup of this chocolate frosting to 1 cup of crushed Oreos in a different bowl, and set aside. The rest of the chocolate frosting will be used to cover the center layer of the cake. Place another cup of frosting into a bowl, and color a bright shade of green with gel food coloring. Put the frosting into a piping bag with a Wilton 103 tip (petal tip), to create the lettuce on the cake. Set aside 1/4 cup of uncolored frosting (to be the sour cream), and color the remaining frosting a bright shade of yellow with gel food coloring. 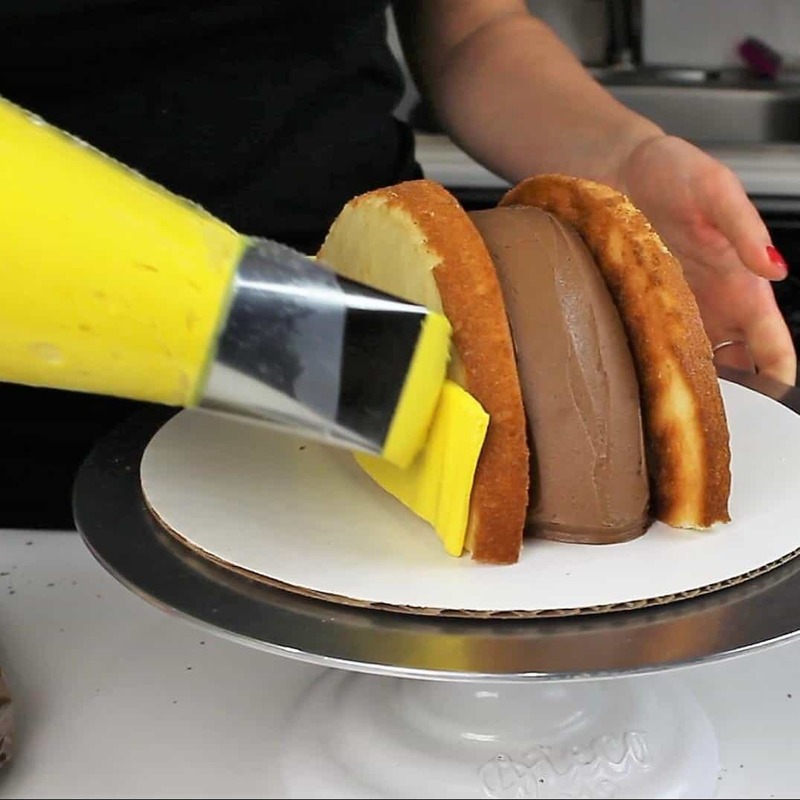 To assemble the cake, cut the cake layers in half. Secure one of the halves of the 6" cake layer in the center of the cake round (vertically) using a large dab of buttercream. Cover with an even layer of chocolate buttercream. Place the two halves of the 7 inch cake round vertically against the frosted layer, and cover these two layers with yellow buttercream.These two layers will be the taco shell. Smooth using a bench scraper or acetate sheet, then add the crushed Oreo/chocolate frosting mixture on top of the 6 inch cake half. Next, pipe on some lettuce on top of the Oreo mixture with the green buttercream. Gently place some of the colored shredded coconut on top, then add the fondant diced tomatoes. The last step is to top the cake with a dollop of white buttercream. I would like to know how much is it 12 cups in grams. 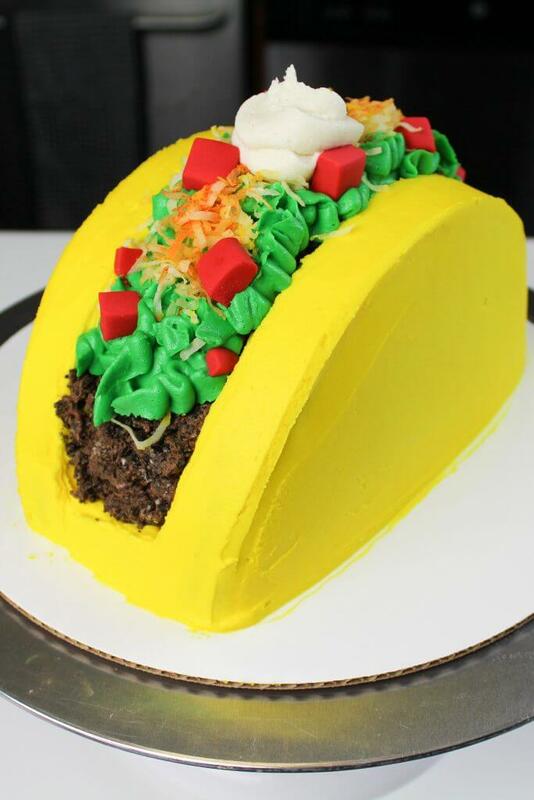 Can I make the taco cake ahead of time? Keep in fridge or freezer? yes you can! If you put it in the freezer, be sure to transfer it to the fridge for a while before taking it out and letting it warm to room temperature. That way you will reduce the amount of temperature shock/condensation! Hi there! I wanted to make this into a smash cake for my son’s first birthday party. I would have to make two…. How would you suggest making the cakes smaller? I feel like they would be way too big as they are now. Thanks!!! You’re so talented and creative! Will this work with boxed cake mix? Honestly not sure since I haven’t used boxed cake mix in a long time, but if you freeze the layers and they’re sturdy enough I would think it should! If only making one cake can the frosting ingredients be cut in half? I know it’s always tricky altering recipes in baking. The recipe calls for 2-7″pans and 2-6″ pans. I assume the 6″pans are for the center but if I use your chocolate cake recipe it calls 7″ pan. Can you clarify if the 6″ pan is what I should use for the center of the taco and if what cooking time I need to adjust on the chocolate cake recipe for the pan size change? thanks! This is really just a half batch of my normal vanilla layer cake recipe! With my original recipe I had enough batter to make an entire extra 7 inch cake layer, that I saved to use for a future baking project. If you poured all the batter into one 6 inch and one 7 inch pan, they’d be too thick and not look proportional once they’re frosted. I’ve update the recipe to make just two, larger layers to avoid this! Sorry for the confusion!! I was trying to follow your response to Scott, but I have some additional questions. #1) the cake recipe that is included within the recipe will be all the cake batter that needs to be made to assemble this cake, #2) if this is the case, am I still using the 2 different size cake pans, and #3) you stated that you updated the recipe to make just 2 larger layers…is this reflective of the ingredient list shared on this page. Sorry for all the questions, but I am trying to make sure I get it correct. Yes, this recipe makes all the cake you need, and it needs to be made in 2 different sized pans. The current post reflects my latest changes. Hope that helps, and happy baking!! Hey. I made it this past weekend and actually used 2-9″ cake pans for the vanilla cake to make a larger taco shell for the two cakes and then made a separate chocolate 7″ cake for the center of both. Worked really well for the 2 9″ vanilla cakes using the recipe just had to monitor the cook time. Thank you for this tasty and fun recipe! I just wanted to note that the cake batter was barely enough to make one taco – fortunately I only needed to serve 2 people! The icing was enough to make 3-4 tacos, so I had a ton of icing left over. Is it okay if i use a 10 and 9 in pan? yes, but you may need to increase the amount of batter you use to get layers that are the same thickness! The vanilla recipr makes 2 8in? Do you have the half recipe for the Chocolate too so I can make the 2 cakes instead of 4? Sorry for all the questions, this is the first time I will be making a cake NOT from a box! I’m just wondering if your buttercream recipe can be used to make flowers. Does it firm up nicely in the freezer? it def can, and it firms up great in the freezer! I just want to clarify, it says one 7” pan and one 8” pan, does that mean it makes two tacos, one 7” long and one 8” long? Also to make two tacos do I just cut your chocolate cake recipe in half, or smaller since it is for 4 layers? This is a half batch of my cake recipe! You make two cake layers, and cut both of them in half. One half of the 7 inch cake recipe becomes the center of the taco, and the two halves the 8 inch cake recipe become the taco shell. You will end up having one half of the 7 inch cake layer as a leftover, but you can eat it with buttercream, as a taste test of the cake 😛 Hope that helps! I was really confused, and I think this explains it pretty well — however, I have a 9″ and 8″ pan. Will this work? I’m not sure how to know how much batter to put in each pan either. Can you help? I want to make this within the next day or two…. so sorry for the delayed response Lynn! I usually try to fill my pans about 1 inch high with batter. So sorry for the confusion Lynn! I updated this a while back and clearly somethings got lost in translation! There is no chocolate cake layer! I mention at the bottom that in the sliced photo I used a chocolate cake layer I had on hand from a separate baking project, but this recipe is made with two vanilla cake layers, to keep things simple and prevent you from having to make two different types of batter! The middle vanilla cake layer is simply frosted with chocolate buttercream, to be the “beef” center! I updated the recipe to make a seven inch and six in cake layer, because I wanted the layers to be a tiny bit thicker! Did you have a recipe for the chocolate frosting in the middle?